Earbuds bring us an invaluable reward for a small price: our peace of mind and those few minutes away from the incessant chatter of the world. Gym, subway, work, home, anywhere these are our constant partners in the crime of solitude. Their importance has triggered cutting-edge research that packs powerful sound and comfort into these puny structures within the small budget of $50. The market is able to ensure durable build and deep, substantial audio signature from the tiny drivers in this price range. We sorted through thousands of earbuds to find the best earbuds under $50 which balance quality and price. These 15 earbuds span across the $50 price range, connectivity, features and audio signatures. Budget earbuds – are they really worth it? The price of a pair of earbuds pivots around build quality and audio quality. The construction material required to build earbuds cost relatively less. Most of the capital goes into research and marketing. $50 is a reasonable budget to innovate and cater good sound to a large audience. Within this price, you can get a pretty good audio quality that casual listeners can easily discern. Beyond $50, you move into the light audiophile territory. At an increased price you get more neutral response and more resolution. Unless you are a music critic, you won’t notice the difference. Audiophile: These have either a neutral or slightly bass-bumped response. They focus on quality audio and many don’t even have an inline remote. Sports earbuds: These earbuds are meant for active lifestyle. 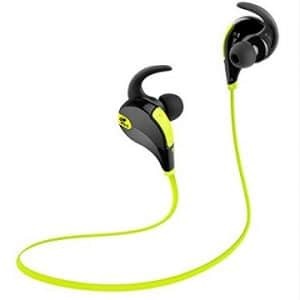 They might be water-resistant, shock-resistant, bass-heavy and also have features like earhooks and Bluetooth connectivity. How to make my earbuds sound better? Right earbuds: Choose the right earbuds. Research what bass, midrange and treble mean. And select earbuds that suit your musical tastes best. Bass-heavy earphones sound good with EDM, Techno, hip-hop, rap, dubstep etc.. A small mid-bass bump is good for all genres. Neutral sounds good with classical music, orchestral music, rock, jazz etc..
Eartips: Most of us just jam the earbuds in our ears with the stock medium-sized eartips. As soon as you get the earphones try them on with all available sizes of eartips: small, medium and large. The one that allows the least external noise is the best fit. You might need eartips of different sizes in the left and right ears. File Quality: MP3 files are lossy. This means they do not carry all the intricacies of the original. A lot of details are compressed while converting to this low memory-consuming format. Download songs in high-resolution formats like FLAC or WMA. These consume more memory space. So maybe you could keep only your favorite songs in these quality formats and rest in MP3. Cleaning: Clean your earbuds frequently. See that earwax does not clog up the area right in front of the driver. This will smother the sound. Take off the eartips and rub the earbuds with cotton dabbed in rubbing alcohol or a dishwasher solution. Sides: Always wear the right earbud in the right ear. This makes sure the audio is reproduced as it was originally meant to be. Equalizer: Use the equalizer tool on your phone or media player to find the preferred audio response from the earbuds. Want less bass? Reduce from the equalizer settings. Carry Case: If the earbuds come with a carry case, use it to store them while in transit. The circuit of the earbuds may get shorted because of excessive physical strain on the cable, the ear pieces or the plug. Comply Foam tips: These foam tips bring noticeable change in the audio of any earbud. The compressed foam expands in your ear canal once worn, thus providing perfect seal. Noise isolation will help you hear the bass better and make the earbuds sound more substantial. Earbud tray: An earbud storage tray will allow you to wrap the cable around it. This keeps the cable from tangling and losing its integrity. Amplifiers and DAC: You can get portable amps and DAC at reasonable prices now. Check out the Fiio amps. These increase the overall volume of the earbuds and also enhance the frequency response. These power the audio and make it ‘open up’. 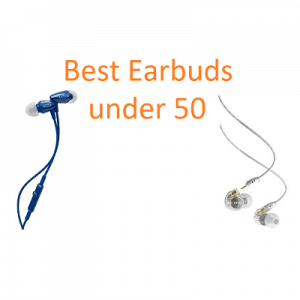 What are the key features of quality earbuds under $50? 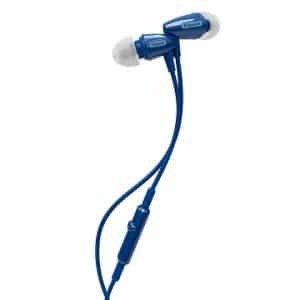 Audio: Although the audio signatures of the best earbuds under $5 vary, we selected only those that do, whatever they do, best. There’s no boomy bass or tinny-sounding audio here. You get as much detailing as the price can muster, in some cases more. Earbuds with decent extension on both sides of the frequency spectrum have been selected. Build: Durable earbuds that live out their price were selected for this list. The joints were checked for possible weaknesses. The integrity of the driver casing and the plug casing was questioned. It also depends on how you handle them. We also checked how comfortable the earbuds were for prolonged use. The type that hurt the inner ear was avoided. 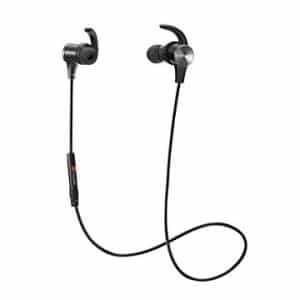 Features: At the higher side of the 0-$50 price range, the best earbuds have numerous useful features like detachable cables, Bluetooth connectivity, zipped carry case, inline remote, active noise cancellation etc. Both sports and audiophile earbuds have been covered. Value on Money: Since 0-$50 covers a lot of ground in earbuds market, we didn’t compare earbuds on absolute prices. We evaluated the value offered by the earbuds for their price. Whatever amount you pay for them, we want you to get the best for your money. MEE Audio M6 made some waves for being a quality earbud at a very low price. The M6 Pro trumped the predecessor with its advanced design and detachable cables. The best part about these super-affordable earbuds is that all parts can be bought separately. The M6 Pro even sounds like a professional monitor with its neutral and natural audio. The clear design of the earbuds and the cable is stunning. M6 Pro nails every top quality we looked for in the best noise isolating earbuds. The MEE Audio M6 Pro earbuds look remarkably like $200 earbuds. Both the clear and black versions have translucent earbuds which subtly display their delicate circuitry. The bottom of both earbuds carries a port to which the cable is connected. The ear pieces are designed such that the cable has to be routed over the ears and worn. This is just like when professional musicians wear their earbuds. They sit comfortably in the small of the ears. The construction looks durable for long-term use. The detachable cables have a metal mesh weave covered in transparent plastic. These budget earbuds come with two detachable cables. One is with a 3-button inline control and another is a pure audio cable. With most earbuds with detachable cable, the main problem is getting a spare cable when the original cable fails. MEE anticipates this and supplies two cables. Not just that, each part, be it the left earbud or the right earbud or the cable, it can be easily replaced by contacting MEE. The earbuds come with a carrying case, 3 sets of normal silicone eartips and 3 sets of flanged eartips. A set of Comply foam eartips and a ¼ inch studio adapter are also included in the zipped carry case. MEE Audio has come a long way since the M6. The M6 Pro earbuds call themselves ‘musician’s IEMs’ for a reason. We chose the Comply foam eartips to listen to them. These provided ample passive noise cancellation. Although burn-in is a volatile topic with the audiophiles, we let the M6 Pro ’open up’ by pumping 40 hours of white noise. Once done, we were ready to test. The M6 Pro affordable earbuds have a balanced tone. The bass is punchy and tight. We were surprised by how well the bass was controlled from bleeding into mids. The midrange sounds more articulate because of the clean sound. The upper mids have some bite to them which makes them sound harsh with bad recordings or sibilant upper vocals. The upside is that you thoroughly enjoy the vocals. The treble is clean and smooth. There’s no sibilance here. The soundstage is intimate and plays mostly in your head. We didn’t see the need for an amp here. Amp might highlight the slight spike in upper mids. The call quality is excellent with M6 Pro. Both sides can hear the conversation clearly and the volume buttons work well. Beyerdynamic is known to produce good audiophile fare when it comes to headphones. With the Byron earbuds, they proved that their earbuds uphold the legacy. These are unabashedly audiophile with their neutral frequency response. The build quality is reliable with significant metal contributions. And these are one of the few earbuds with Android-compatible 3-button control. All these are top qualities for the best earbuds under $50. The Beyerdynamic Byron affordable earbuds have an elegant look to them. The drivers are encased in aluminum. As a result, the ear pieces can take a fair beating. They don’t weight down your ears though. The eartips extend straight out of the drivers. The cable is quite lightweight and ends in a 3.5mm plug. The inline mic hangs close to the mouth and picks up your voice clearly without you having to hold the mic. The cable is tangle-resistant. The inline remote control of these earbuds is a 3-button affair. The Play/Pause/Call answer/Call reject button works with both Apple and Android devices. The volume buttons work with only Android devices. Byron is one of the few earbuds that provide this facility with Android. Three pairs of eartips in small, medium and large are sent with the earbuds. A carry pouch is shipped with the package. The Byron earbuds by Beyerdynamic have what we look for in expensive earbuds. The neutral, natural audio response is open to interpretation and responsive to equalization. Bass, midrange and treble partner up in perfect balance with each other. The audio from these small drivers is anything but tinny. It plays with the force of bass creating a strong undercurrent for the rest of the frequencies. The bass is oomphy, it has a rumbling presence. But in interest of being different from the bass-heavy earbuds under $50, Byron invests more in mids and highs. The midrange sounds airy and nuanced in a way that defies the size of these earbuds. There’s plenty of layering of details that makes you want to go back and revisit your favorite tracks. The highs maintain the same level of resolution and sound smooth. There’s no bite to the treble and hence Byron makes for a laidback listen. The soundstage is intimate to your head. Complicated tracks are easily handled by the agile performance of these affordable earbuds. We recommend burning-in with white noise for around 20 hours to get the full range of sound from these earbuds. Sennheiser CX 300 II affordable earbuds are unbeatable for their price. These are true high-quality earbuds under $50. The audio and build quality are exceptional at its price. Sennheiser has brought down the full force of its audio legacy on this set. Add a pair of Comply foam eartips and you have a superb audio signature with warm and meaty bass. These earbuds are the best audio deal you will get in the best earbuds under $50. The Sennheiser CX 300 II earbuds look pretty plain for the price. The ear pieces are constructed out of plastic. The eartips project straight out of the ear pieces. The drivers sit in bulbous casings, but they are low profile. They do not jut out of your ears when worn. With the right eartip, the fitment holds on through rigorous head shaking. The earbuds are only available in black. The cable of these budget earbuds runs 1.2m long and ends in an L-shaped plug. This is an asymmetrical cable that runs longer to the right ear than the left. This allows you to run the longer cable from behind your head. Cables from both the earbuds join at a heavy duty Y joint and extend to the plug. This cord is durable with tangle-resistance properties. But being cylindrical, it tends to get tangled every now and then. The plug casing is quite sturdy and not likely to get damaged that fast. Apart from two eartips of other sizes, a classy easy-access pouch is included with them. The CX 300 II earbuds are also shipped as a different bundle with Comply foam eartips in 3 sizes. This is costlier but it still lies below $50. We suggest you buy Comply foam eartips separately in only your size to be more cost effective. 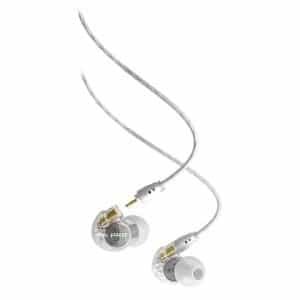 The CX 300 II affordable earbuds from Sennheiser are remarkable in their audio quality. We tested them with Comply foam eartips for the best performance. Right out of the box, these sounded tonally balanced. The quality and quantity of bass is satisfying. With a tight seal, you get deep, rumbling low-end that extends better into lower frequencies than we expected of the price. There’s definition to the low notes, it’s not one of those sloppy affairs that tramples all over the vocals. Genres like EDM, Techno, Hip hop etc. are made twice as enjoyable by bass like this instead of blindly boosted bass. The midrange shines with vocals and guitars. They camp comfortably on the power of bass to sound substantial. They are highly resolved too. You discover new details in the music you haven’t heard before. The treble is detailed but the harsh edges have been unkinked. The warm sound of CX 300 II favors all genres, from the delicate rock, to passionate jazz to mindless heavy metal. The SoundPeats QY7 Bluetooth earbuds are hugely popular online. They bring one too many features at a very reasonable price. Joggers, Gym freaks and anybody who doesn’t like wires should look out for this product. Built for a firm fitment these earbuds find place for buttons and mic too. The audio is suited for the powered environment of your workout heaven. The performance-price trade-off makes them one of the best earbuds under $50. The Soundpeats QY7 Bluetooth earbuds consist of two chunky ear pieces connected by a semi-flat cable that goes behind your head from one ear piece to another. The driver casing of one ear piece carries the volume navigation button, the multifunctional button for play/pause/call answer/reject, an LED indicator and the mic. The other earbud carries the charging port with a pull-out cover. The eartips angle away from the casing and lodge comfortably in your ears. In spite of the size, the earpieces are lightweight. They don’t weigh down your ears. A hooked accessory is shipped with these affordable earbuds. These grip the inner ear and keep them from falling off while doing a strenuous activity. Bluetooth v4.0 is leveraged for wireless connectivity. This is an energy-smart protocol. Battery lasts through 4-5 hours of music playback and 5-6 hours talktime. QY7 is IPX4-rated, so it’s water-resistant to a point. It can withstand sweat. These running earbuds also use CVC 6.0 technology to reduce noise. Two extra pairs of eartips, two extra pairs of earhooks, a cable cinch for managing length, a shirt clip, a charging cable and a zippered carry case accompany them. They are available in 7 colors. The QY7 Bluetooth earbuds from SoundPeats bring seamless wireless connection to the table. We didn’t find any connection drops while using these earbuds within 33 feet from the playback device. The bass line is impressive with a mild mid bass bump. This makes the audio sound weighty unlike the tinny fare of inexpensive earbuds. The fast and well-paced workout music will pump clearly through them. Bass has moderate control as well. It doesn’t hamper other frequencies so casual listeners will appreciate its performance. Vocals sound clear and highs are smooth. So you can listen to the songs fatigue-free for long hours. With the right eartips you get good noise isolation too. The call quality was good. People on the other end can hear you clear through the mic. The volume level gets high enough to drown the ambient noise effectively. Sony MDRXB50AP extra bass earbuds are a treat for the veritable bassheads who still care about overall audio quality. This is mature bass that works on enhancing the frequencies that are already there. The design is modern and sophisticated. Durability is evident from the feel of these earbuds. They appeal to both the casual listeners who favor bass and the audiophiles who like the low-end punch for some genres. We couldn’t have let them pass by the best earbuds under $50 list. The MDRXB50AP bass earbuds from Sony confirm to their new chic standards. The lovely curves of the ear pieces are done in black and metal and branded tastefully. The eartips angle away from the driver casings and sit ergonomically in your ears. These affordable earbuds have a flat tangle-resistant cable. We found it solid in the face of daily abuse. The cable has a single-button inline remote. This has an omni-directional mic which easily picks up your voice. The cord ends in a slim L-shaped jack which fits through any phone case with ease. A soft storage pouch is provided to carry them around with your everyday stuff. One more remarkable thing about MDRXB50AP is the absence of cable noise. There’s no hissing noise from when the cable moves around and rubs against your clothes. These come in three combinations with black: silver, blue and red. The Sony MDRXB50AP budget earbuds are designed expressly for people who appreciate bass. With Sony’s expertise with audio, they manage the bass bump gracefully. Only the frequencies available in the song are bumped and combined with a deep sub-bass performance. Most inexpensive earbuds just boost bass blindly and end up creating ghost frequencies that aren’t part of the song. This results in a muddied reproduction of the actual song and boomy bass. The bass of MDRXB50AP enhances only the available frequencies and adds weight to the bass. This creates a fun sound signature that is still clear throughout the frequency response. Mids get their attention. Vocals don’t have to fight with bass for the centerstage. The treble is agile but devoid of any bite that makes highs harsh. 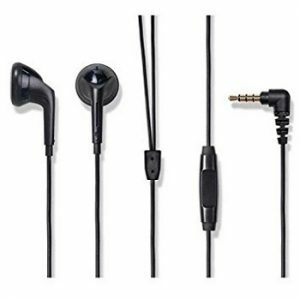 These affordable earbuds also provide excellent noise isolation when used with the earbuds of the right size. 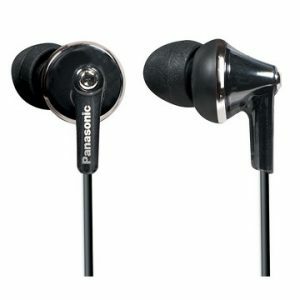 Panasonic HJE120 ErgoFit earbuds are one of the most popular earbuds in the online market. 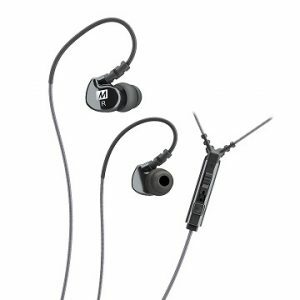 These are inexpensive earbuds that perform a leg up from the stock earbuds that come with music playback devices. The peppy colors these come in can brighten your experience. These are for the casual listeners who can’t tell bass from treble. These are fun, enjoyable and comfortable. That’s all it takes to be on the best earbuds under $50 list. The Panasonic HJE120 ErgoFit earbuds look stylish right out of the box. The driver casings are compact with a drastic curve. The eartips project straight out of the earbuds. The ear pieces sit flat in your ears, they don’t poke out. The fitment is truly ‘ErgoFit’. You can wear them to gym without having them fall out all the time. These earbuds are designed such that you can wear them both directly or routed them from behind the ears. Both ways, they remain comfortable for long-term wearing. These affordable earbuds have a 3.6 feet cable terminating in a straight 3.5mm plug. They don’t have any inline remote or mic. That’s our only complain from HJE120 ErgoFit. Stock earbuds almost always have inline remote and we are spoiled by it. These Panasonic earbuds are available in 9 colors. Their slightly translucent shells are catchy. Eartips of small, medium and large sizes are the only accessories that accompany them. Panasonic HJE120 Ergofit budget earbuds are meant to be an inexpensive alternative to stock earbuds. But we were pleasantly surprised by the clarity of audio at this price. Unlike their similarly-priced peers, they do not brashly boost bass. The result is a clarity that defies their price. The bass is oomphy though. The audio has good body because of the plentiful representation of the low frequencies. It’s just that bass is not bloated enough to seep into the midrange. With the right eartips, we found the noise isolation of these earbuds agreeable for gym and workout. Do not expect the sound quality of Sennheiser CX 300 II. But casual listeners on a shoestring budget will be pleased. The SoundMagic E10 earbuds are the moderately-price earbuds that sound and look premium. Since the brand is not familiar, people tend to pass over these. They aren’t very pretentious with the marketing either. But when we tried these we were enraptured by their audiophile quality sound. The neutral sound signature hides behind a bold metal build. These were no-brainer for the best earbuds under $50 list. 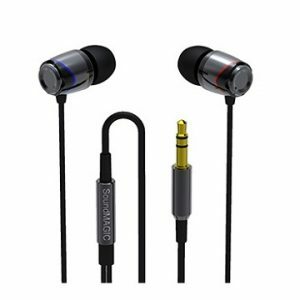 The earbuds of SoundMagic E10 earbuds are made completely of durable metal. This is a two-tone design done in charcoal black and jet black. Only the color of the cable differs amongst color choices. The eartips emerge straight from the ear pieces. The ear pieces are heavier than plastic earuds but not overtly beefy. But if you are spoiled by the light weight of plastic, E10 might need some getting used to. These affordable earbuds have a textured cable that ends in a slim straight 3.5mm plug. The plug can get through any phone case. The cord is tangle-resistant but it doesn’t have an inline mic or remote. They are shipped with 7 pairs of eartip. 3 have smaller orifice than the other 3. One is a double-flanged eartip. Between these 7 choices, you are bound to find the best fit. A shirt clip is also included to reduce cable noise. The zipped carry case makes the E10 more portable and robust against every day use. Noise isolation is one of the biggest strengths of SoundMagic E10 earbuds although they don’t have active noise cancellation. This is possible because of the wide array of eartips and the design. This alone enhances the audio quality of these earbuds. They have a neutral and agile audio response. The bass is rich with texture and burrows deep into the sub-bass region. Both bass and treble are well-extended. Bass is also active so it can handle complicated mixes. It is well-controlled so it doesn’t spill into mids. Mids and treble have exceptional clarity and detailing. The crisp performance can do justice to classical, jazz and soft rock. For some casual listeners bass may seem tame. It is not as warm as the other earbuds in this price range. But the neutral sound signature allows you to modify the sound every which way. E10 will respond to equalizing much better than bass-heavy earbuds. MEE Audio Sport-Fi M6P earbuds sounded like a great deal on paper. So we decided to check them out. We realized that we had spotted a nice sports earbud instantly. The build and the extra accessories make them stable for the rigorous use in the gym. They are also available in wired model without microphone and a wireless model. We liked the wired model with microphone and remote best. Their performance for the price earned them a place in the best earbuds under $50 list. Mee Audio Sport-Fi M6P wired earbuds are designed to be worn from behind the ear. A piece of wire is routed over the ears. This area of wire has been constructed of memory wire in M6P which allows it to fit you properly without casing any discomfort. The eartips angle away from the driver casing for an ergonomic fit. The joints of the cable to the eartips and remote are reinforced with flexible material which relieves strain from your head movement. The whole construction is coated with water-resistant coating for dealing with sweat during workouts. The cable of these affordable earbuds is tangle-resistant and ends in an L-shaped plug. It has an inline remote control. This has a volume rocker and a multifunctional button. A cable cinch is provided along with a cable clip to reduce the unnoticeable cable noise. 6 pairs of eartips including double and triple-flanged ones and a zippered carry case are shipped with them. They are available in 7 colors. The Mee Audio Sport-Fi M6P wired earbuds play into the popular tastes and bring enhanced bass to the audio signature. This, along with the superlative noise isolation, drowns out the grunting and groaning around you in the gym. At small volumes, there’s some cable noise. But at moderate volumes, it’s effectively smothered. The bass bump does not cause any distortion up to the top most volumes. Because of the wide audio range of M6P, you are not likely to pump the volume that high anyway. The midrange and highs are clean and crisp. The call quality is decent for normal use. But we would avoid serious business conferences on them. Fiio is a revered name when it comes to amplifiers and DACs. But does the audiophile indulgence in these equipment translate to good earbuds. With EM3, yes it does. These earbuds also bring relief in terms of their non-invasive design. The Fiio has gone audiophile on the audio signature while retaining the fun characteristic with a punchy bass. Together with the comfort and the single-button inline control, they make a strong case for being one of the best earbuds under $50. Fiio EM3 open earbuds are a respite to people who loathe the large size of headphones and the intrusion of earphones equally. These sit on the foyer of the ear canal and play their music. Earbuds like this are less common these days. The ear pieces are mostly plastic and low-profile. They sit snugly in the ears and do not stick out. You can sleep sideways with these plugged in. The cable is the regular cylindrical type. A single button remote is included inline. The 47-inch cord terminates in an L-shaped plug. Although the design is minimalistic, the EM3 affordable earbuds are built for durability. Even at their low price, they will easily last longer than your stock earbuds. At their price, they only include two 3 pairs of foam sleeves for comfort. Fiio EM3 earbuds land a peg up from the stock earbuds that come with various phones. The bass and treble both have much better extension comparatively. The bass adds volume to the audio instead of sounding thin like the earbuds in the same price range. It is rich and dynamic and handles all genres well. The mids also get good attention here, maybe a little more than the bass. Many casual listeners and audiophiles like this kind of audio response where the vocals and guitars are highlighted. The treble is clear but smooth. It doesn’t have excess sparkle that can tire your ears out. The light warm audio of Fiio is very different from the usual offerings in sub-$50. You can try these in a store first or order from some place with easy returns. If you are tired of earbuds that snap the slightest strain, the Klipsch S3M earbuds are your answer. We are yet to see a more durable pair of earbuds in the price range. We are talking about ran-through-washer and dryer-still-working durability. Klipsch has a huge following amongst the audiophile crowd because of audio quality too. The natural audio response is enhanced by the ridiculous comfort levels. All these are one too many reason for them to be on the best earbuds under $50 list. The Klipsch S3M earbuds have a curious bullet shape. Somehow this detour from the usual design is very comfortable. Eartips project straight from the ear pieces. The eartips are also long-oval, not like the round eartips that you usually see. These promote additional comfort by fitting properly into the ear canal. The cylindrical cable is marketed as tangle-resistant. We found them quite easy to unclump and use. The cable of these affordable earbuds has a mic and a single button. But with this one button you can carry out multiple functions. Single tap is for call answer/reject, play/pause and mute unmute. 2 taps is for next track and 3 taps are for previous track. You press and hold the button for volume increase. There’s a learning curve to the various functions but these are compatible with all phones. They come with a zipped carry case and two more sizes of the oval eartips. The come in 5 tribal colors. 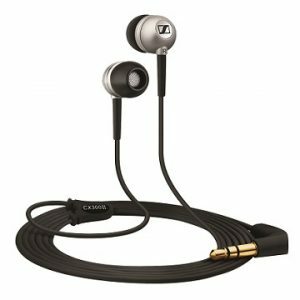 The Klipsch S3M earbuds live up to the Klipsch audio quality, provided you temper your expectation according to the price. These are natural-sounding earbuds with a fun and enjoyable sound. The bass, mids and treble are balanced well in all respects. The low-end is punchy with decent extension into the sub-bass region. The midrange has clarity and better detailing than we expected from the price. The treble is sparkly but devoid of any sibilance though. Because of the equal focus on bass, mids and treble, these frequencies get a chance to shine when the song permits. They all blend together to perform even the most complicated tracks properly. TaoTronics TT-EP01 active noise-cancelling(ANC) earbuds are your affordable option for a quiet airplane travel. Not everyone can afford Bose and very few people like the feeling of full-size headphones. These are built premium with their metal architecture. They can bring about 30 dB drop in the ambient noise. Accessories to keep the earbuds safely in place are provided. What more can you ask of the best earbuds under $50? 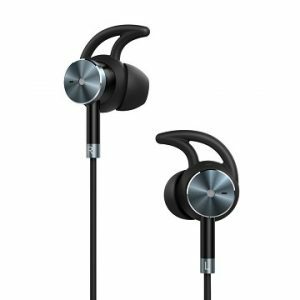 The TaoTronics TT-EP01 ANC earbuds have drivers made of light aluminum alloy metal. You get both the durability of the metal and light weight of the plastic here. TaoTronics claims that this also reduces the battery consumption of the set. Earbuds protrude at an angle from the earbuds. Little earhooks are shipped with EP01 which grip the inside of the ear and provide secure fitment. These are easy to remove or replace. The cable of these affordable earbuds is 55 inches long. It has a 3-button inline remote and mic with the multifunctional buttons and the volume buttons. Further down the cable you have the noise-cancellation module. This is a lightweight structure which does not weigh the earbuds down. The battery lasts through 15 hours of ANC use. You can switch the ANC off. Once the battery drains, these still work with passive noise isolation. The earbuds are charged via a USB cable. These are shipped with 3 ear hooks, 3 eartips and an airline adapter. The TaoTronics TT-EP01 earbuds bring an affordable respite from the Bose earbuds. But how does that affect active noise cancellation? We outrightly agree that at this point nothing cancels noise like Bose headphones and earphones. With EP01, low frequency noises are cancelled effectively. Conversations, which are a higher pitch, are suppressed but not completely drowned. Airplane engine quiets down due to the volume boost of the DAC circuit. ANC does not create any noticeable hissing noise. So you can enjoy your songs without the hum of internal circuit. The audio response is well-balanced across bass, mids and highs. This is especially noticeable when the ANC is turned off. Many earbuds have trouble keeping the bass together when ANC is switched off. But here the bass remains tight. It does not encroach upon the mids. The midrange and highs are clean and crisp. Wooden earbuds are not just a style statement. Wood imprints its own warm, earthy feeling to the audio. 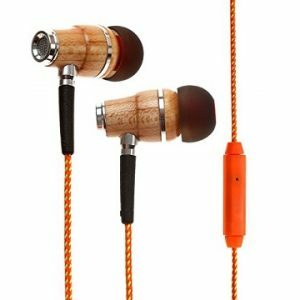 The Symphonized NRG earbuds are the best wooden earbuds in the sub-$50 price range. They are not just for the look. There’s a genuine touch of the wood’s audio quality in their audio. They combine it with the modern tangle-free cable and a strain-free plug. We couldn’t have picked a better product for the best earbuds under $50 list. As expected from the name, the Symphonized NRG wooden earbuds are handcrafted from genuine wood. This is evident from the ear pieces which are embellished with chrome rings. The eartips project straight out of the ear pieces. These are comfortable in the ears but they may project out a little. We recommend you don’t sleep sideways with these on anyway. The cable of these affordable earbuds is braided in Nylon. It isn’t tangle-free as such but it’s easy to untangle once clumped. It has an inline mic and remote control. The latter has only one button which serves as a Play/Pause/Call answer/Reject button. The cord terminates in a 45° plug. This relieves much strain on the plug. NRG comes in 14 colors. The eartips and the cable are color matched. It comes with 3 sizes of eartips and an eco-friendly pouch. The Symphonized earbuds sounded every bit like we were expecting them to. There’s the meaty bass which substantiates any genre of songs. The mid bass has a slight bump which adds to the character of the audio. It’s not a purist’s dream but all the casual listeners and most audiophiles agree. The midrange is not as affected by the bass as with cheaper earbuds. Vocals and guitars see plenty of clarity. Treble is matched to the bass but not overly bright. Koss Plug earbuds are meant to provide the best noise isolation without actually using active noise cancellation. ANC applies some pressure in the ears which causes discomfort to many people. The Koss Plugs are supplied with innovative new foam eartips that are capable of the perfect seal. These earbuds deliver excellent audio quality, fit for audiophile tastes. 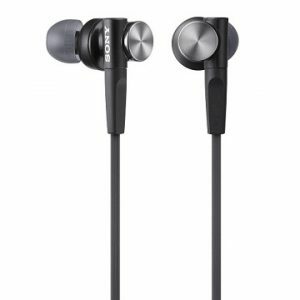 They were highly recommended for the best earbuds under $50 list. 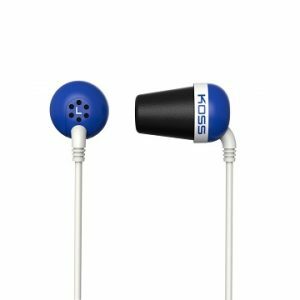 The Koss Plug earbuds look like their namesake. The driver casings look small and then taper in size. They are fit with customized foam eartips. As soon as you plug them into the ears, the foam expands and creates a good seal. But you need to play a song and fidget around till you get the best fit. This exercise is necessary to get the best sound out of these earbuds. The foam eartips are sensitive to temperature so we recommend you don’t leave them bare in AC. The foam will solidify and not expand or contract properly unless returned to normal temperature. They are highly position-dependent. One might say the earbuds look ugly but we will take that for the sound. A four-feet cable extends from these affordable earplugs. It doesn’t have any inline mic or remote control. It has decent tangle-resistance though. The Plug is available in 6 snappy colors with contrast wires. It is very lightweight and hence almost inconspicuous even after continued use. These are highly durable earphones for the price. The Koss Plug earbuds are a treat to listen to. But like we mentioned, first you have to adjust them to get the best sound. Once you learn the trick, be ready for some awesome noise isolation. In absence of ambient noise, you get decadent bass that thumps with authority. Bass and treble extend much more than the price demands. You will be wowed by the performance on either end. The midrange is clear of any bass intrusion. Both male and female vocals shine. The treble is clean and polished. It doesn’t have any harsh edges that lead to sibilance at high volumes. These earbuds are good for all genres. They are detailed enough to be interesting but not so much as to sound bad with poor quality recordings. TaoTronics Bluetooth earbuds create the perfect musical haven for an active person. Wireless connectivity? Check. Easy to operate? Check. Decent battery life? Check. Comfort? Check. These earbuds are quite affordable to host all these qualities. Besides these they have a couple of interesting features for better usability. These babies own a place in the best earbuds under $50 list. The TaoTronics Bluetooth earbuds look stylish from the outside. The driver casings are slim barrels that hold the circuitry. The eartips angle away from the driver housings. Each ear piece is fit with an ear fin. This grips the inner curve of the ear to provide a secure fitment during running and other strenuous activities. Both ear pieces are connected by a flat cable that goes behind your head. These affordable earbuds connect wirelessly via Bluetooth v4.1. The battery lasts through 5 hours. The standby time is 175 hours. There’s an inline 3-button remote hanging inline with a mic. This has a multifunctional button for play/pause/call answer/reject. The volume buttons also work as track navigation buttons. CVC noise isolation technology clears out the noise from the mic pickup. This results in cleaner audio on the other side of the phone call. It is available in four colors. The TaoTronics Bluetooth earbuds pander to the popular taste for bass. In a noisy environment like the gym or the streets while you run, the music sounds substantial only if the bass has a boost. These earbuds have pumped up the bass decently so that it adds volume to the audio. But it’s not so much that vocals or guitars are drowned. All the funky modern music, it sounds good over the chattering of the crowd. The treble is forgiving on all genres. The dream of many casual listeners is to just to replace their stock earbuds without emptying their pockets. And Philips SHE3590 earbuds are cut out for this. They are both affordable and have good audio quality. 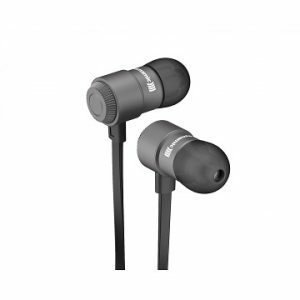 They have also shown themselves to be more durable than earbuds in this price range. They are clearer than them too. This is one of most affordable options in the best earbuds under $50. The Philips SHE3590 earbuds are pretty to look at. The driver housing is bulbous. Eartips project straight from the ear pieces. Both sides connect to normal cylindrical cables. The cable is 3.6 feet long and terminates in a 3.5mm plug. There’s no inline mic or remote control. This is simply for enjoying music. The cord terminates in a straight 3.5mm plug. Three pairs of eartips are supplied with these affordable earbuds. They come in 7 pleasant colors. 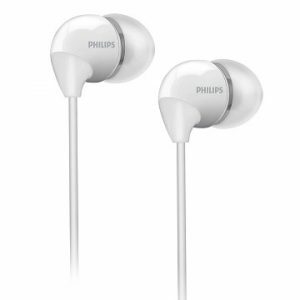 At this price, we don’t want to critique the Philips SHE3590 earbuds very harshly. As casual listeners, we found the audio enjoyable. We didn’t think they sounded tinny or boomy. The audio is well-defined and clear for the price. The bass does not distort, it sounds natural. The midrange and highs balance well with the bass.